I was more or less unaware of Michael Cisco until reading some interesting reviews from Paul Charles Smith, Larry Nolen and J M. McDermott of his more recent novel, The Narrator. My interest suitably piqued, I decided to have a look into Cisco’s work myself, as it looked as though it’d be the kind of thing that I’d like. 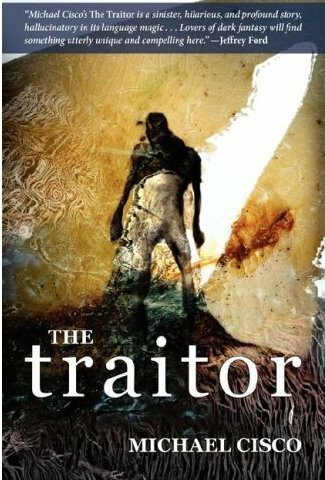 I also have The Narrator to read, but thought I’d start with his earlier work The Traitor. The novel opens with the narrator, Nophtha, awaiting execution for his traitorous acts. As a child he’d been spurned by his parents and had eventually been taken in by his uncle, a man who had been rejected by wider society. Nophtha’s uncle had recognised that the boy would make a good spirit eater (which would lead him to be further shunned by society as well as his family). The spirit eaters absorb the potentially harmful spirits of the dead to protect the living. Nophtha proves himself to be particularly adept as a spirit eater and is tasked with capturing Wite, a soul eater who captures the energy from spirits and rather than, as Nophtha would, discharging the energy he gained, he collects this to make strengthen himself. Wite’s actions, though destructive, don’t seem to be particularly grounded in any recognisable immoral streak. Certainly he is selfish. Nophtha recalls an instance where he witnessed Wite pluck the soul from a smoker as the man was irritating him. Nophtha’s own lack of a sense of self and Wite’s need to destroy to gain strength give the novel bleakness. Were either of them immoral, one could at least be disapproving. Whilst the lack of concern for others is somewhat distressing, it is difficult to actively dislike Wite or Nophtha. This makes for a more rewarding read, though. One couldn’t accuse Cisco of writing a shallow novel. At this time he was a young boy; he certainly didn’t fully understand the implications of joining the spirit eaters for his future. He appeared to be attempting to please his uncle. This lack of self-motivation runs through the novel. When he meets with Wite and (after choosing not to destroy him) takes up with him, he also meets Wite’s sister, Tzdze. This is ultimately a cause of his own downfall. He falls in love with Wite’s sister and though, as noted, has none of his own motivations, in wishing to please both Wite and his sister finds himself swaying between two very clashing desires. The narration is pitched almost perfectly. It’s clear that Nophtha isn’t practised at writing his thoughts. Cisco has managed to produce text which manages to evoke both the style of one who is unaccomplished as a writer, yet is pleasurable to read. Most of the novel is like this. I enjoyed it a lot. I have quickly come to admire Michael Cisco as a prose stylist. I rather suspect that had someone simply described the way that he’d written this novel, as per the quote above I’d have been less than keen to look any further into it. It is repetitious, both in choice of words and ideas, and the sentences are often huge. Yet he has succeeded in producing something which is like very little else and is a joy to read. A real achievement. I can’t recommend this highly enough. I sincerely hope that Michael Cisco obtains the recognition he deserves. You should buy this now. * I briefly thought that this quote may seem to be a little bit of a spoiler for some. But then the novel is called The Traitor, so I am inclined to think that your enjoyment of the novel is hardly going to be destroyed by knowing that one sentence. This entry was posted in Review and tagged michael cisco. Bookmark the permalink.